This is a relatively rare view of Matlock Green and the church, with the Victoria Tower and Masson in the background from. The large property called Dean Hill House is in the foreground; for some time it was the home of Miss Margaret Harrison, who was a major benefactress in the town, and her brother William. 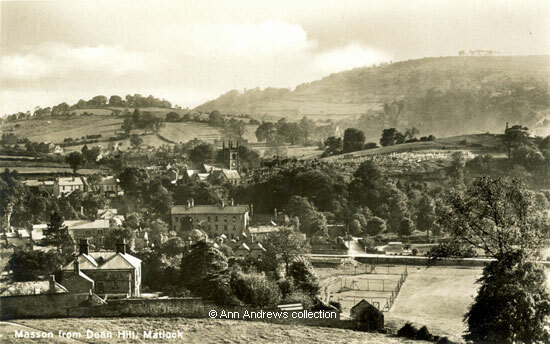 Census and trade directory evidence shows they moved to Matlock not long before the 1881 census. Cricket nets were out on the Causeway Lane ground but they were not being used. The only people to be seen were two in the churchyard - they look like black dots - and one or two on Stoney Way. The suggested dates for the top picture have been reached because of two events. Firstly, Matlock's War Memorial, on the top of Pic Tor, was unveiled in August 1921. Secondly, the local council's development in Starkholmes had not been built when this picture was taken. It would have been a prominent landmark but the first houses were not completed until 1932. The new houses were urgently needed. At a Council meeting in 1930 a letter had been read out from a Mr. J. J. Lynch of Starkholmes requesting that, if the Council were to build the new homes then being talked about, some should be in Starkholmes. He added that many people were living "in miserable dwellings entirely unfit for human habitation and the conditions were deplorable". In May 1932 36 tenants were selected for these new homes out of nearly 150 applicants. 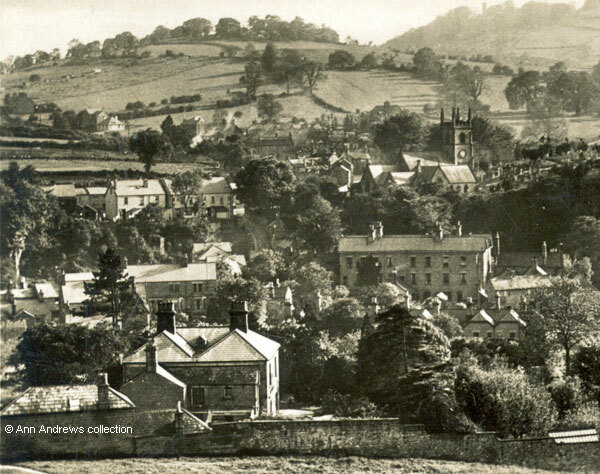 There was also some discussion about what to call the development and the Councillors initially decided to call it "Holmestown", which was a play on Starkholmes and Matlock Town. However, their architect, Mr. J. Simpson, complained about the decision as he felt that "Shortlands" and Whitewood Way" were more appropriate because the names had formerly applied to the lands there. There was some dissent, and the odd rather flippant suggestion, but common sense eventually prevailed and the architect got his way. Enlargement: Matlock Green, Knowleston Place, Stoney Way, Matlock Town and Starkholmes. entrance to the cricket ground is next to the Almshouses. It is not clear when the spelling of Dean Fields/Dean Hill was changed by the Council. Dean Hill House was still shown on the OS map of 1967, so it is assumed that it was some time after that. A family called Deane lived in Matlock in the sixteenth century. See the details of the 1544 Will of Robert DEANE and the arms of DEANE. St. Giles Church (Interior), Matlock. The Loca-Vu Photo Co., Publishers, Sheffield, No.80. Printed in England. Not used. The Harrisons had probably not been in Matlock long in as they did not advertise in Kelly's Directory for 1881. In 1861 William was living at High Street, Skipton whereas Margaret was with her parents in Gargrave. Both were living in Gargrave in 1871. They can be found in Matlock in the 1881 census | the 1891 census. Miss Margaret Harrison was at Dean Hill House in the 1901 census. "Derbyshire Times", 24 May 1930. Houses wanted. "Derbyshire Times", 28 May 1932. "Derbyshire Times", 24 September 1932 and "Derby Daily Telegraph", 20 September 1932.